Mulundi Village is in Kitui County, Eastern Province, Kenya. 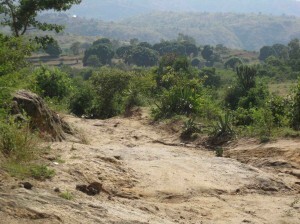 The village is approximately due east of Kitui town, about 4 miles from where the paved road ends. About 800 families live in the village. Which is more of a region than a population center. 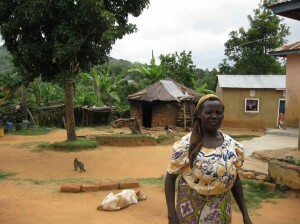 The village is populated primarily by members of the Kamba tribe. The people speak Kikamba, Kiswahili and English. Schools: There is a primary school Mulundi Primary and a Secondary School, St. Mulumba’s Kwa Muema. There are 4 churches (Catholic, Anglican, African Inland and Redeemed Gospel) and one African Kamba Shrine. The nearest town, Kitui, is 8 km (4.8 miles) away. Market days are Mondays and Thursdays and many people walk in from Mulundi to buy and sell. Very few people have cars. There are a few who have motor bikes or bicycles. Medical: there is a general hospital in Kitui, a dispensary at the primary school and traditional Kamba healers in the village. Mulundi is at 1050 meters or 3,412 feet. While Mulundi is more of a region than a concentrated population center there are a couple of very small stores which sell staples like bread, cornmeal and powdered milk. A number of informal vendors sell their product at the cross roads near the primary school. 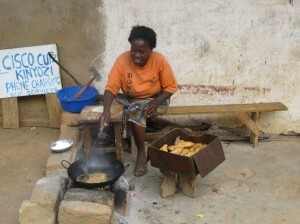 The woman in this picture makes and sells Mandazi (free-form doughnuts). There is no refrigeration in the village but some electricity, which is very expensive. Note the small business of cell phone charging (this is unrelated to the mandazi enterprise). The owner of the building can help to pay for his own power by charging a fee for people with no power (the majority) to charge their cell phones. Cell phone use is very common as there is no land line phone service to the village. 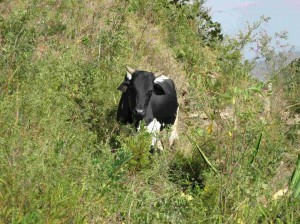 The main economic way of life in the village is subsistence farming. The small enterprises mentioned above are a way to translate a surplus of one item into a balanced diet or to get a little cash to purchase clothing or pay school fees. Other work for pay is “jua kali” (Swahili for “hot sun work”) skilled or unskilled labor that means working under a hot sun, examples of it are masonry and fetching water. Education is free up through standard 8 but there is a uniform required. In many cases school uniforms are the only clothing children have…and shoes are not required. After primary school families need to pay for further education. The fees for one year of secondary school are around US$120. A set of two uniforms costs about $50 and, typically, can be used for two years before they wear out or outgrown. Staple foods in this area are bananas, eggs, ugali (polenta made from finely ground white cornmeal), rice and sukuma wiki (collard greens). Other foods which are common include onions, tomatoes, chicken (kuku). In Kenya there is a swahili term “kienyeji” which means regional specialty. It varies from region to region based on what foods are readily available. 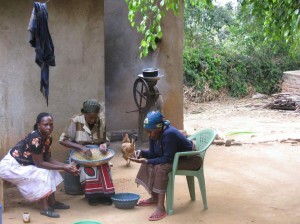 The kienyeji for Kitui region is muthokoi (Maize mixed with beans and or beans or peas then boiled). High illiteracy level especially among women. A receding water table: walking around the village there are many dry wells. Deforestation: A growing population and cooking with charcoal has caused deforestation, which in turn allows soil erosion and a declining water table. Global climate change has aggravated the above: rainfall is not what it once was and the water table is not being replenished. Malaria: People are still getting infected and dying from Malaria. Charitable agencies occasionally have distributed nets but the methods used let many slip through the cracks. At this time no agency is working to distribute nets in the Mulundi area and you cannot buy nets outside of Nairobi. HIV/Aids: An estimate is that 25% of people in the village are HIV positive. This has resulted in orphans in a society that previously had none due to a strong extended family structure and love of children. One of the most important ways to help the community is through education. By encouraging education, especially of young women the village can learn how to adapt to the changing environment. The students learn about diseases, like Malaria and AIDS, and how to prevent them leading to healthier lifestyles. Educated mothers take better care of their children and are able to teach them and help them with their studies; they also stand a better chance of making a living if widowed or abandoned. Education is the hope for the future for Mulundi Village.